In May/June of 2016, Oakley Sensei returned to Hokkaido Japan for the 20th-plus time. There he renewed his long-time friendship with Yamahira Sensei, a true master, and the most well mannered man you could meet. Yamahira Sensei maintains that the manners of a true martial artist are reflected in his behaviour, both inside and outside of the dojo. This perspective is obvious in the way Yamahira Sensei trains and lives. While in Hokkaido, Oakley Sensei also had the opportunity to visit a powerful waterfall, deep within a hidden valley. It was an ideal place to for martial arts training. When doing Tensho Kata in front of that waterfall, you can feel the Ki flow through your body. There are no words to describe the awareness of the surrounding nature that develops by training there. This year, 2013, marks the 50th anniversary of the commencement of Sensei Oakley’s career as a teacher of Goju-Kai Karate-Do and the introduction of Goju-Kai Karate-Do to Australia. Sensei Oakly received his Dan grade and teaching diploma in 1963 from Master Yamaguchi Gogen. Then in 1967 Sensei Oakley received his Shihan grade from Master Yamaguchi Gogen who at the time was president of Zen Nippon Karate-Do GoJu-Kai, making him the first Australian to attain this achievement. 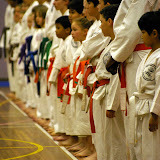 To mark this occasion our club hosted a Kumite and Kata tournament on Saturday 12th October 2013. Thank you to all the participants it was a great day held in the true spirit of Goju Karate-do. 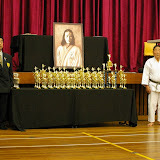 In October 2008 Sensei Oakley celebrated his 45th year of training and teaching GoJu Kai Karate-do in Australia. We held a tournament an weapons demonstration in honour of this occasion and invited special guests from Japan that Sensei has trained with over the last 35yrs. Click on the pictures below to see some of the highlights from the day.